This week’s discussion is a topic that has been on my mind a bit lately. As seems to by typical of recent discussions, it is closely related to the Atonement. However, an event at Church today brought this topic to the front of my mind, and I decided to write about it. What I want to write about is the offering we make to God and the difference between sufficiency and perfection. The incident I mentioned happened today during Sacrament Meeting. Now, for those unfamiliar with our services, I should point out that the sacrament (what would be called “communion” in many other churches” is one of the few prayers we say exactly, word for word. In fact, it is typical for the bishop to ask the person blessing the sacrament to repeat the prayer if any errors are made. Well, today a relatively new convert to the Church was blessing the sacrament, a young man who is probably about 17 years old. And he had quite a hard time getting through the prayer. He was visibly nervous and made several errors. However, each time he misspoke, he would try to correct it. As this was happening, I was wondering how the bishop would react. I paid careful attention after the prayer. To my surprise, the bishop smiled at him and nodded, approving his efforts. And this got me thinking. The prayer this boy offered was was far from perfect. Even though he had tried to correct his errors, several mistakes were made. Yet, the bishop decided that the efforts he had put into the prayer were sufficient. As the sacrament was subsequently passed, I started thinking about how this is in reality a metaphor for our lives. We all make an offering to God, and in all but one very special case, each of those offerings is marred, flawed, and in all ways imperfect. Yet, through the grace of God, we have a hope that our offering will be sufficient. Elder Holland spoke about this story to encourage us to help the poor and the needy. (see October 2014 Conference). And that is certainly a useful application. But I see it in this context as an even broader encouragement for us to do “what we can” to make our lives a sufficient offering. 1. We can do our daily best to practice personal righteousness. This involves daily, simple steps. For example, we can make sure that not a day goes by that we do not find ourselves on our knees in prayer. We can ensure that the sun never sets without our having devoted some time to the study of the scriptures. We can make sure devote adequate effort to our callings and responsibilities. These may seem simple, and in fact they are. But if we’re honest, how many of us struggle to meet these bare minimum standards of personal commitment? I suspect most of us have trouble with even these simple things. Yet, if we are trying to do what we can, this seems a good place to start. 2. We can help those around us. Everyone knows someone who is having trouble. It could be someone struggling with unemployment or illness. It could be someone going through a divorce or other personal tragedy. It could be someone bleeding from a hidden wound such as an addiction or depression. It could be someone suffering from doubts about his or her personal self worth or testimony or faith. Let’s face it – if we are honest, even those of us who are doing “pretty well” in life are coping with some of those problems. No one is immune. Yet, the Savior pointed out on more than one occasion that when we express love, kindness, and understanding for our fellow man, we are in fact expressing love, kindness, and understanding for him. So doing what we can of necessity involves helping those around us. Sometimes this requires a bit of extra effort, for many times the problems are well-concealed. But if we will make an effort, it will help our own offering to rise in value to the Lord. 3. We can be generous in our tithes, offerings, and charitable contributions. In the church, we are all expected to give 10% of our income to the church. This is, of course, the minimum standard. Yet we have many other opportunities to give abundantly. For example, we can contribute generously to the church’s fast offering program. President Marion Romney is famous for encouraging this, saying “If we will double our fast offerings we shall increase our prosperity, both spiritually and temporally. This the Lord has promised, this has been the record.” (quoted in October 1974 Conference). We can also give to those in need. King Benjamin taught that we must “not suffer that the beggar putteth up his petition to you in vain, and turn him out to perish.” (Mosiah 4:19). The Lord has commanded, stating specifically that any attempt to magnify our callings is futile unless we “succor the weak, lift up the hands which hang down, and strengthen the feeble knees.” (D&C 81:5). Whether we contribute to the church or contribute to some other worthy charitable organization, a significant part of making a sufficient offering involves generously contributing to the welfare of others. 4. We can support our leaders. In the Church, it is crucial to support our leaders. Whether it is the president of the church and the apostles, or whether it is our local stake president and bishop, supporting, sustaining, and following the counsels of our leaders is vital. No good will ever come from dissent. Recently, we saw a shameful example of this. In our most recent General Conference, a small group of individuals raised a voice of opposition when the church was invited to sustain the leaders of our church. These people, obviously craving a platform for their own agenda, met with reporters and made statements as to how they are opposed to certain teachings of the church. The Lord expects us to trust him. I can say with perfect confidence that no offering we make will ever be accepted if we fail to support our leaders. Certainly, questioning and seeking confirmation and even praying to God that further revelation will come is entirely acceptable. But rebellion is the sin of Lucifer, and those who follow his example will reep his reward. After all, God himself described such practices with the words “sin lieth at the door” (Gen. 4:7). 5. We can regularly attend the temple, if able. I have already spoken of this on several occasions, but attending the temple makes everything better. I know from my own life that the times I am regular in my worship there are the times I make the best offering. I find I sin less, I do more good, I receive more revelation, and my life is on the whole better and shinier and holier when I make it a priority to go there often. One of the best ways to ensure our offering is acceptable is to renew ourselves often. And there is no better way to do that then by worthily partaking of the sacrament regularly. There are many reasons why this is important, and I have covered them elsewhere as well. But for this purpose, the most important thing about the sacrament is that it keeps us focused. It reminds us of our offering, it brings these thoughts to mind, and it makes worship a priority. Also, focusing on the Atonement intensely reminds us to repent and encourages us to try harder. And with that, we also receive an increase of the Holy Spirit. Regularly partaking of the sacrament is crucial. 7. We can repent early and often. This is an example of the type of small and simple things the Lord uses. 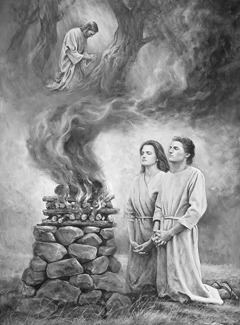 Recall that the prophet Alma taught “that by small and simple things are great things brought to pass….and by very small means the Lord doth confound the wise and bringeth about the salvation of many souls.” (Alma 37:6-7). Elder M. Russell Ballard taught that while “we observe vast, sweeping world events; however, we must remember that the purposes of the Lord in our personal lives generally are fulfilled through the small and simple things, and not the momentous and spectacular. (April 1990 Conference). Indeed, our purpose in life is not to work mighty miracles. Over the thousands of years of human existence, the Red Sea has only been parted once. And while the scriptures recount many “big events” this is because they are interesting to record and interesting to read. Yet the only scripture that actually matters is the Book of Life, which will be filled primarily with ordinary, simple men and women whose only great work was a life of personal righteousness. Yet those men and women will reap the same reward as the prophets who did great and spectacular works. Thus, while Nephi may be the one we know about, the Celestial Kingdom will have far more people like Sam and Zoram who did nothing spectacular, but nonetheless endured to the end in righteousness. Now, some of us (and my “some” I of course mean “most”) probably worry that our offerings are not perfect. We probably tend to focus more on our massive list of sins, temptations, and imperfections and disregard what we feel to be minimal works of righteousness. Indeed, and this may sound a bit depressing, but it is possible that we will struggle with certain sins, temptations, addictions, imperfections, and inadequacies all of our lives. No matter how hard we try to subdue the Natural Man, we may approach the judgement day with him still clinging to us. What does this mean for our offering? As Nephi taught, we are saved by grace after all we can do. (2 Nephi 25:23). And this focuses on a key point – all we can do. Our God is omniscient, and this means he knows all things. He knows what we can do, and he knows what we cannot. As much as he wants us to strive for perfection, he knows that there are some things that are simply too hard. And the secret, the piece of information that we rarely discuss in the Church, is that it is acceptable to be imperfect if it is truly the best we can do. See, God only expects us to do what we can – he does not demand that we do what we cannot do. To Paul, who complained of a secret temptation or affliction that he called a “thorn in his flesh.” And though he tried to overcome it and asked God to remove it, this blessing was never granted to him. Yet to this, the Lord said “My grace is sufficient for thee: for my strength is made perfect in weakness.” (2 Corinthians 12:9). And this is the point – God only requires us to make a sufficient offering of all we can. As Elder Boyd Packer taught: “there is no habit, no addiction, no rebellion, no transgression, no offense exempted from the promise of complete forgiveness.And then he promises.” (October 1995 Conference). It is entirely acceptable to rely on the Atonement to cover the weaknesses we cannot cover ourselves. And this is the distinction. We are imperfect by ourselves, but the Atonement of Christ is adept at making flawed things perfect. The final step in our development is accepting this grace. After all, “perfect” carries with it a sense of completed action, and Christ is described as “the author and finisher of our faith” (Hebrews 12:2). In the words of Moroni: “Come unto Christ, and be perfected in him … and if by the grace of God ye are perfect in Chris t… and deny not his power, then are ye sanctified in Christ by the grace of God, through the shedding of the blood of Christ, which is in the covenant of the Father unto the remission of your sins, that ye become holy, without spot.” (Moroni 10:32-33). Trust in this promise and do what you can. If there is something that seems too difficult, then do your best. Trust in the Atonement, for it will take your flawed offering and make it into something glorious.